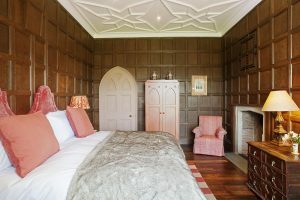 With two perfectly decorated, but very different rooms, the North Wing offers the ultimate in grown-up decadence, with quiet and secluded locations both inside and outside the property, enabling you to take a break from busy lifestyles and hectic schedules. The team behind the North Wing take your peace and tranquillity most seriously, which is why the property offers adult-only accommodation and is not suitable for children or babies. Whilst dogs are not welcomed at the property itself, local kennel information can be supplied. Situated on the border of both Cheshire and Shropshire, visitors to the North Wing are within easy reach of the historical market towns of Nantwich and Whitchurch, and can easily explore the wonderful heritage and gardens this area has to offer. With the larger Roman town of Chester within driving distance and the bigger metropolitan cities of Manchester and Liverpool nearby, there is something to do for every mood. With Crewe railway station easily accessible and three international airports – Manchester, Liverpool and Birmingham – close by, transport links to The North Wing are excellent. 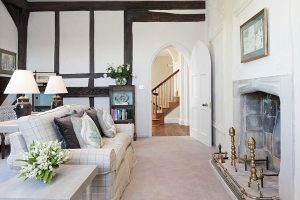 Upon entry to the North Wing, guests are welcomed by Stephan or Sue into the main living space with its comfortable sofas and antique writing desk. Striking fabrics frame the enchanting view across the sweeping lawns, down to the lake. 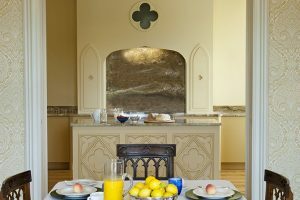 The restored decorative cornicing leads through to the dining room, where guests will enjoy a delicious locally sourced breakfast whilst seated at the grand table. This room features the revived white marble fireplace which originated from the Wellington wing of the Abbey. 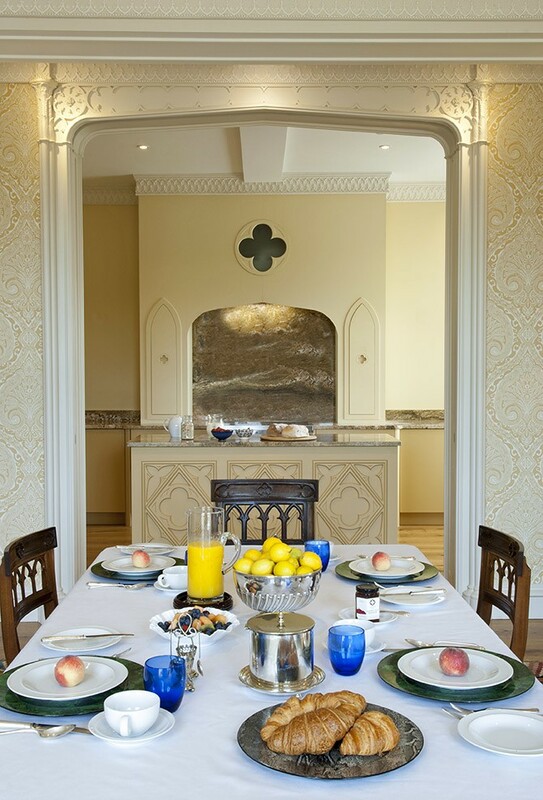 Located off the dining room behind discreet sliding doors, is the bespoke kitchen with quatrefoil detailing. 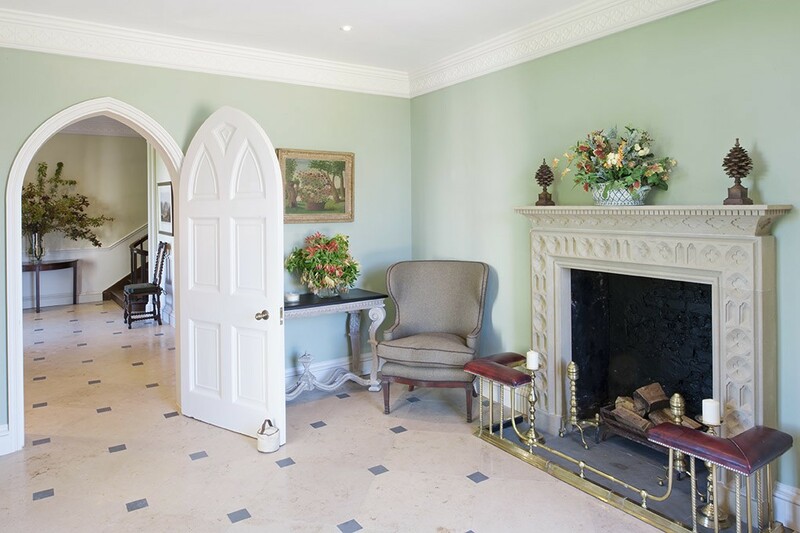 Moving through the property, visitors will delight in the stately staircase that takes you to the first floor, where both the Salamanca and Bhurtpore rooms reside. 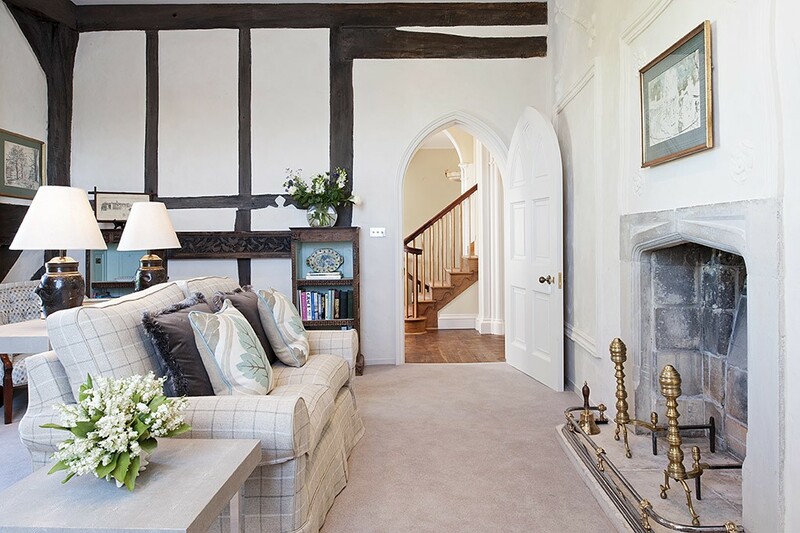 As well as the two bedrooms, the Tudor study provides an alternative living room in which to read, relax and rejuvenate. Offering a stunning outdoor sanctuary, Combermere Abbey ancient woodland is perfect for an evening stroll. If you prefer an afternoon walk, you can explore the Pleasure Garden and Garden Wood as it leads you down to the lake with stunning countryside views. While at the North Wing, why not sample The Wellington Drinks and Nibbles Selection? You can choose to have your favourite tipple and a selection of tempting nibbles ready to accompany the breath-taking views on arrival, or you can order from their selection at any time during your stay. The North Wing is owned by Sarah Callander Beckett, also known as SCB. Sarah inherited the estate and assumed responsibility for Combermere in 1992, after a successful career in marketing and PR in the USA and Far East. 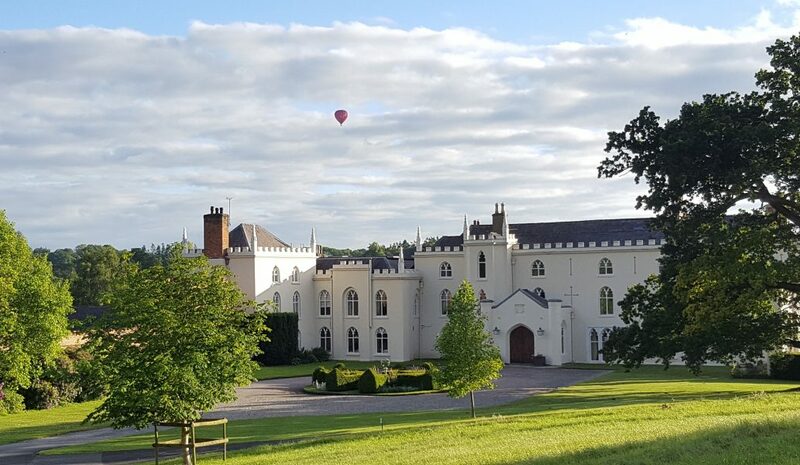 Passionately committed to the renaissance and the restoration of Combermere Abbey, the North Wing and the surrounding estate land, Sarah works tirelessly with her team, with an energetic and enthusiastic approach to their projects. 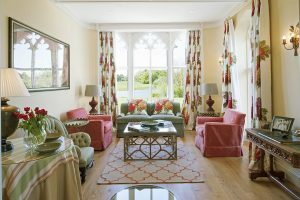 Following the multi-million pound restoration project that was completed in 2015, the North Wing transports you to a place where history, beauty and luxury combine to create a truly unforgettable place to stay. With such a fabulous building to work with, renowned interior designer Nina Campbell was called upon to employ her exquisite style and sensitivity into making sure that each room had its own distinct look, while maintaining a cohesive theme throughout and complementing the rich architectural history of the North Wing. Nina has done a stunning job; creating a sanctuary of both decadence and calm, the bedrooms at the North Wing offer the ultimate in opulent luxury for those who stay. The Salamanca is furnished with a luxurious super king size, antique gilded tester bed. Light and airy, the Salamanca room features peaceful shades of pale blue and silver. Spend time at peace in the room, relax in front of the flat screen television, or submerge yourself in the marble clad bath of the en suite as you take in views over the lake. The en suite bathroom also features a full shower, toilet and his and hers basins. The Bhurtpore room offers the ultimate in flexibility, available both as a super king size room or as two sumptuous twin beds. Also, with a flat screen television, a fireplace and a designer armchair, the Bhurtpore is a wonderfully relaxing place to spend time. 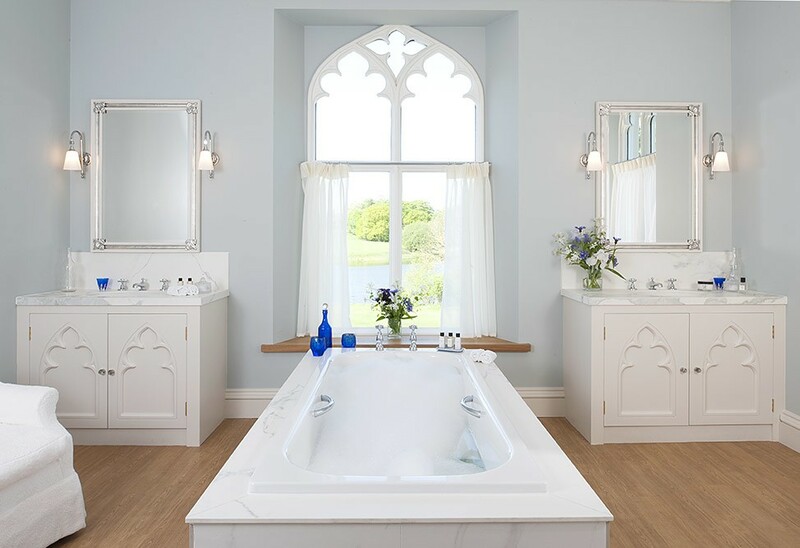 As with the Salamanca bathroom, the Bhurtpore en suite shower room offers sweeping views over the lake, as well as a full shower with toilet, single basin and marble topped vanity unit. 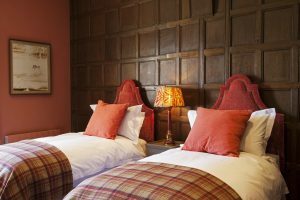 The Salamanca – Midweek (Monday to Thursday) – £185 per night. Weekends (Friday, Saturday and Sunday) – £200 per night. The Bhurtpore – Midweek (Monday to Thursday) – £150 per night. 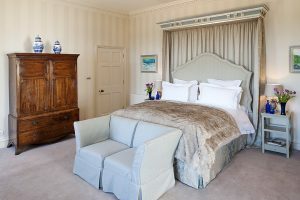 Weekends (Friday, Saturday and Sunday) – £165 per night. All prices are based on double occupancy. Single occupancy discount not available. 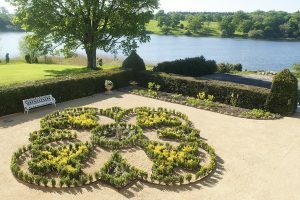 Guests will enjoy a locally-sourced and freshly prepared breakfast, which is served in the dining room from which you can look out over the stunning 143-acre mere. If choosing a cooked breakfast, this is made to order for you; pre-order your choices the night prior from a mouth watering choice of locally sourced back bacon, local pork sausages, your choice of free range eggs, grilled tomatoes and grilled mushrooms. A selection of continental options will accompany your cooked breakfast; options include a selection of breakfast cereals, fresh fruit selection, yoghurt, selection of homemade pastries, toast and Combermere Abbey Estate preserves and Apple juice, which are made from the apple and other fruits from the world’s only fruit maze which is situated within the beautiful gardens. Special requests and dietary requirements will also be catered for. Just speak to Stephan or Sue prior to your arrival. Breakfast is served between 9 and 10am. The North Wing at Combermere Abbey is the perfect place to say ‘I Do’. Stay in the North Wing while you seal the deal at neighbouring Combermere Abbey. The venue can be exclusively yours on your wedding day, with a series of stunning locations for your ceremony, wedding breakfast and reception. For traditional religious ceremonies, Combermere Abbey is surrounded by picturesque village churches for your ceremony, followed by the reception at the Abbey. For those who opt for a civil ceremony, you can say your vows in the Edwardian Glasshouse with views over the stunning gardens as your guests witness your big moment, or marry in the fruit tree maze if the weather is warm. You have found a wonderful place to stay and Boutique and Breakfast is committed to giving you a personalised service so that you can find the right room at the right price. 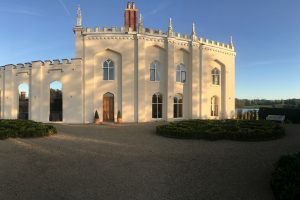 Simply fill in our enquiry form and within 24 hours you will receive a response from The North Wing, Combermere Abbey tailored to your needs. This will be in the form of either a telephone call or an email. I'm still in awe of the value for money of my stay. 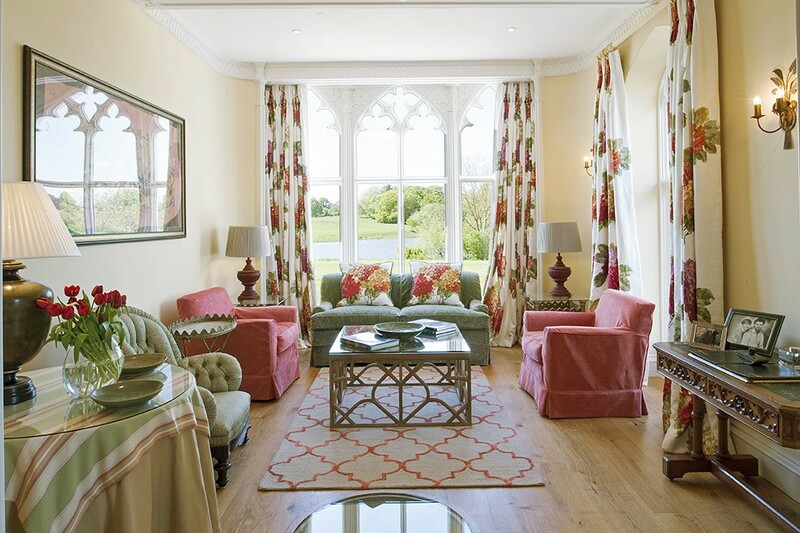 The North Wing has been lovingly renovated and is a well balanced mix of traditional and modern decor. The grounds are beautiful, quiet and visible from every window. Watching the mist rise over the lake as a Buzzard surveyed it from on high was a particular highlight.